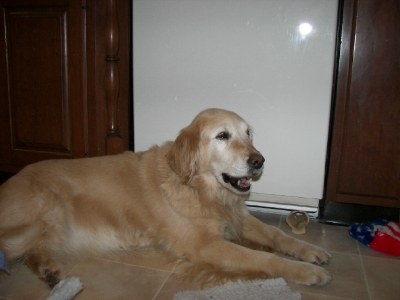 On Tuesday March 13, 2007 we said a final goodbye to our Holly. Holly was 12 years and 4 months. Always very active she slowed way down in the last month and was having trouble breathing. Even the exertion of going outside to do her business exhausted her. When she stopped eating we knew it was time. All of our dogs are special to me in so many ways. 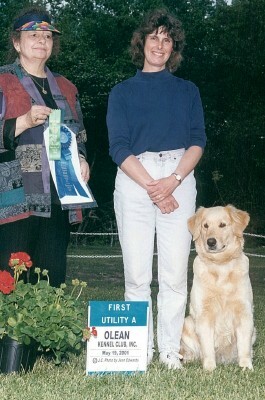 Holly was my first ( and only so far) UD dog. What a thrill that was for us! She was an avid fan of any ball in the area. She used to find the baseballs the boys hit into the woods when they were little. Just tell her “find the Ball!” I will always remember when I tried to field train her unsuccessfully because I couldn’t get her to take her eyes off me and look out for the bumpers…She had many beautiful puppies and was a patient teacher to youngsters we kept. Soft nose, silky ears, she will never be forgotten. She joins her mom, Casey and grandma, Splash at the bridge.